One of the more noticeable and unwanted signs of aging is color changes in skin. For most, they appear as brown spots that can dot your face, hands, arms, and chest. For some people, they’re accompanied by small, flat, white, circular spots. Color-wise these spots are the total opposite of brown spots, but they’re caused by the same thing. Brown spots happen when pigment (melanin) in the skin is stimulated to the point that it’s consistently overproduced, causing dark discolorations. With white spots, instead of making more melanin, certain areas of the skin stop making melanin altogether—the melanin is destroyed. 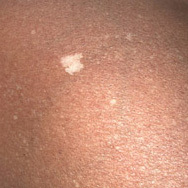 Although they can be bothersome, these white spots are harmless. The first and most important step is to wear a sunscreen rated SPF 30 or higher every single day, rain or shine (you can still get sun damage on a cloudy day), along with other sun protection measures, like wearing a hat or SPF-rated clothing. Because ongoing sun damage is what causes these white spots, preventing any additional damage is key. There are also cosmetic ways to make the white spots less apparent; applying a small amount of self-tanner to just the spots helps them blend with the surrounding skin. Use a makeup brush or a cotton swab to put it on, then wait a few hours to see if the color looks appropriate. If you need to apply more, go ahead. To maintain the color, reapply self-tanner as it fades over time.